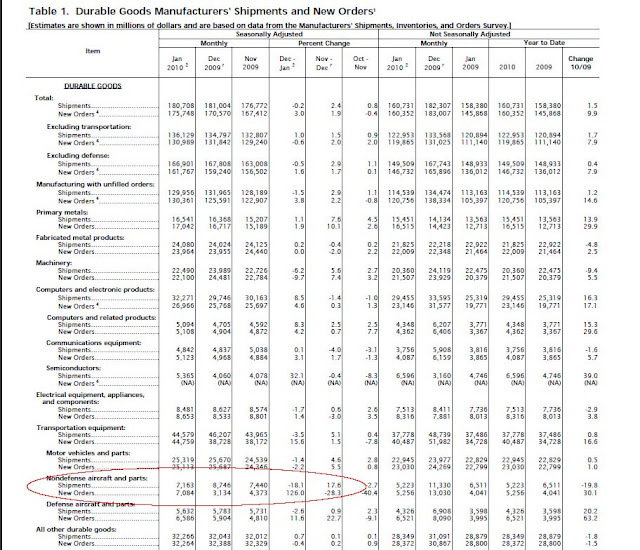 A very confusing Census Bureau advanced report on durable goods orders is sending the market down. The DJIA is off 160points or 1.55%. The headline number was strong -> a 3% rise in durable goods in January, double the expected 1.5% rise. What spooked the market though, was the number after excluding transportation orders. Ex-trans, orders were DOWN .6%, far short of a +1% gain. The report lends credence to the bears who've suggested that big late-2009 gains in GDP were largely due to unsustainable inventory rebuilding, rather than actual, repeatable growth.